You can find anything in Synergy. It’s a crazy patchwork of corporations, public-facing offices, corp “towns” that fill two levels of an arcology, migratory storefronts that drift to the south based on their current popularity…and really pretty folks. If you can find a single person on the Synergy seaside that hasn’t had Pulse’s augmentation surgery…they’re probably lying to you. 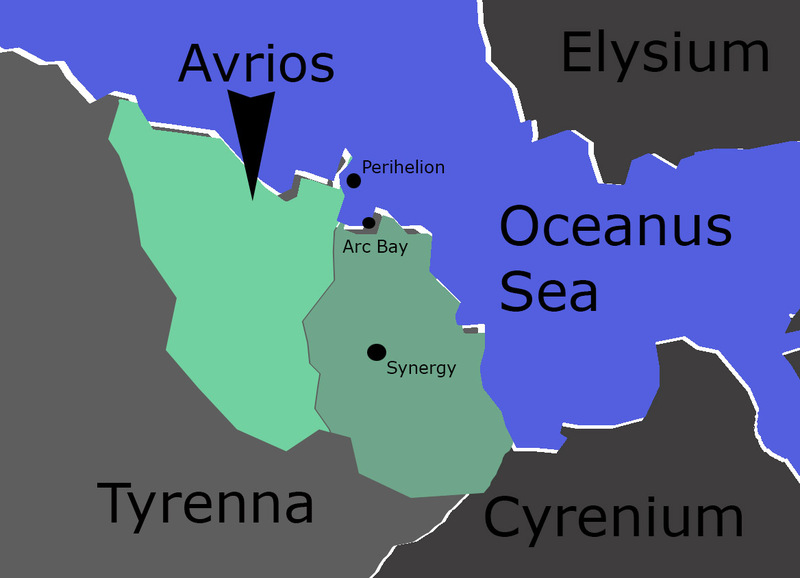 A sprawling coastal corptown against the Oceanus Sea, and the stranger and more socially mobile section of Cynosure’s biggest corporate holding. As you plan your visit to Synergy, give up. As you plan your return trip to Synergy, give up again. Change is constant, structures are torn down and redesigned based on branding changes, and the entire region is as mercurial as the window display at a Pulse cafe’. Well, maybe that’s an exaggeration. Synergy is as dense as any MarsCo town, if not to the same scale, but its corporate owner has subdivided the region a thousand ways, representing thousands on thousands of corporate clients. 99 times out of 100 a given client’s corporate presence is virtual. The more time you spend in Synergy…or in fact, any Cynosure corptown…the more you’ll find shares of startup companies in your ledger you don’t remember ever having visited. It’s like a social disease. It’s worst in Synergy, and you may want to go to a specialist and get your recent transactions touched up. More than any other region on Mars, you can find a huge range of businesses and corporations in Synergy that you can’t find anywhere else. Most corpornations are dominated by one big corporate parent, one that farms out its land to subsidiaries. Synergy is broken up among a huge range of corporations, and the level of diversity is just astronomical. On the negative side, most of the high-end, coastal area of Synergy is noticeably…pretty. Even beautiful. The region’s algorithms seem to prioritize young, attractive folks and current product trends, and as the region shuffles and refreshes its architecture (which it does, constantly) any place, and indeed any person, that doesn’t look like they stepped out of the pages of a catalog can find themselves gently but consistently marginalized. This is truest around the high-rent coast and Arc Bay, the showpiece of the region. Synergy is, overall, false. It’s a joint exercise in creative branding and hacking the ledger system at a base level. If there was a lab specializing in exploiting vectors for their financial ticker tapes, it could easily be in the grimier areas of this corpornation. Cynosure spreads its corporate blame among thousands of clients, and has deftly fobbed more than a few rebellions onto a corporation that was on the way down anyway. So if you need to find a place for a corral of barely-mobile vectors penned like veal calves, sure, go for it. Cynosure probably isn’t that bad, but more than any corp except possibly Marsco, they’re selling ledgers, and they know their product inside and out. On the positive side, it’s a great place to start a corporation, even if they do take a big cut off the top. If the PCs want to get in on the slow road to the megacorps. At least, that’s what the brochure says. The truth is that nothing important happens in a day, or indeed, ever. But Cynosure generally and Synergy in particular are ladders to corporate success with low rungs and good marketing campaigns. If the PCs are working against Lumen, or even trying to find some information about the new megacorp, this isn’t the worst place to be. The cogsunes haven’t done much to change Cynosure’s dodgier business practices, which if anything have gotten worse now that the executives have a megacorporation backing them up. ♃ Trace Elements: The architecture in Synergy shifts pretty much ceaselessly, it’s a safe bet that most neighborhoods will be reconfigured after ten or 20 years. But there may be secrets buried under the layers of pavement and cheap storefronts: Covalence, one of the foremost researchers in high-energy materials and interesting chemicals, once had its home here back when the region was called “Lyceum.” Tracking down a specific artifact from the region’s hazy past is an exercise in marketing archaeology.